is the next generation in digital CAD conversion software. With the capability to convert an extensive list of file formats to PDF, DWF, and images AcroPlot Pro will serve as a nexus for CAD Professionals everywhere. 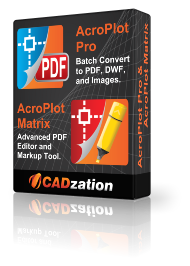 AcroPlot Pro also includes the AcroPlot Matrix program for markup and editing of PDF files..
AcroPlot Pro is has been one of the most advanced CAD to PDF solution available on the market since 2001.